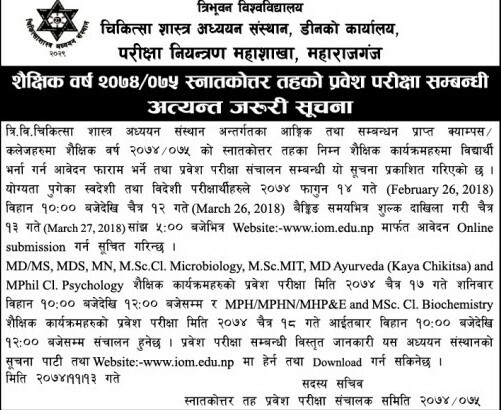 Tribhuvan University, Institute of Medicine, Dean office, Examination Controller Division, Maharajgunj has published urgent notice for the entrance examination of PG programs for the academic year 2074/75 for its constituent and affiliated colleges. 2074 Falgun 14, 10 am to Chaitra 12, 5 pm (26 February to 26 March 2018). > Time: 10 am to 12 am.